Costume design by Comelli for the Grand Duke in Act II of a production of Angelo, Theatre Royal Drury Lane, 1923. Angelo: The Romance of a Great Composer is a play in a Prologue and Three Acts. It was first performed in the Apollo Theatre, New York before being produced by Arthur Collins at the Theatre Royal Drury Lane in March and April of 1923. The story is set in the early 1800s and was inspired by The Life of Hoffman. This adaptation was written by Louis N. Parker, with music composed by E.N Reznicek. The play is set largely in Italy and centres upon the Angelo and his love for a beautiful girl named Giulia. Alongside the flashbacks to their doomed romance the audience learns of Angelo’s latest composition, an opera inspired by his love for Giulia and entitled Undine. Various locations, time periods and characters interweave as Angelo anxiously waits to see his new opera will be received. Much to the dismay of Angelo’s rival, the envious Cipriano, Angelo’s opera is hailed as a masterpiece and the play concludes with Angelo’s vision of the apotheosis of his work. The complexity of the plot and range of locations involved called for at least 18 scene changes, many of which were interspersed with ‘Pictures’ to develop the story. As a result the designer chose to create a set on which 6 scenes could be displayed on one stage with lighting being used to illuminate the relevant scene. The stage hands also had to dress in elaborate black headdresses and tunics when moving the scenery to prevent them distracting from the action. The scenery used in this production was built by R. Andrews and painted by Bruce Smith and Humphries & Watson. The ‘electrical effects’ were overseen by H. Mather. The costumes were designed by Comelli and were made by B.J. Simmons &Co, Morris Angel & Sons Ltd, Mary E. Fisher Ltd and Mrs. F. Field. The Boots and Shoes were made by A.L. Gamba & Co and the wigs were by Clarkson. Comelli (1858-1925) was the house designer of the Royal Opera House from the late 1880s to the early 1920s. During this period he also worked for the Theatre Royal, Drury Lane and also designed costumes from a number of Gilbert&Sullivan productions. This design comes from a collection of costume designs (some of which are costumier's copies) which were originally part of the Archives of the Theatre Royal, Drury Lane. 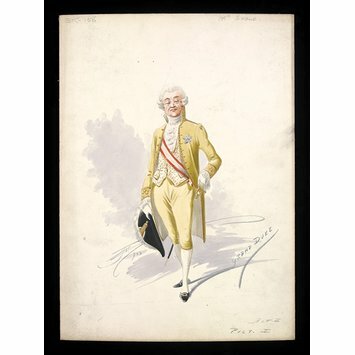 Costume design by Comelli for the Grand Duke in a production of Angelo, Theatre Royal Drury Lane, 1923. A watercolour costume sketch showing a man dressed in a pale yellow evening coat with matching knee breeches. The jacket is decorated with bands of gold around the cuffs and at the centre front. He is also wearing a cream waistcoat decorated across its surface with gold motifs and a red and white sash across his chest. Both of his hands are encased in white gloves and in his right hand he is holding a black bicorne hat, trimmed with a row of white feathers along the top edge, his left hand is resting on the hilt of his sword. The design is signed and dated Comelli, 1923. 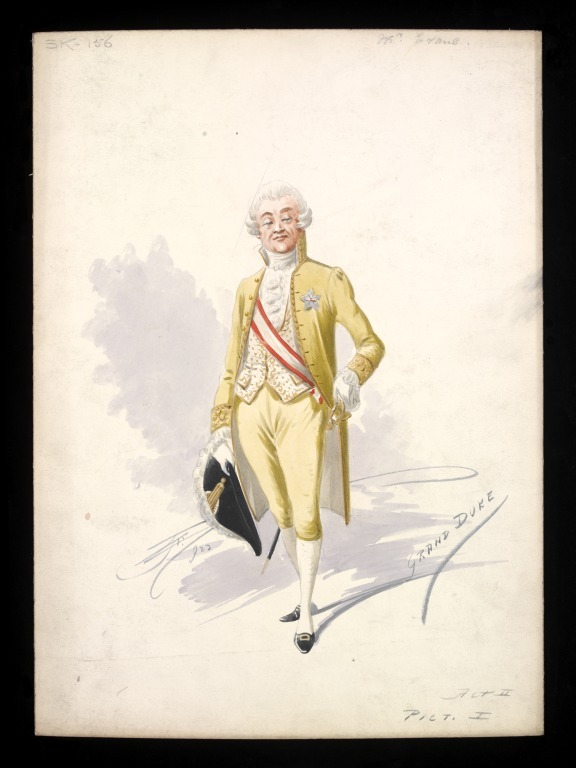 Costume design by Comelli for the Grand Duke in a production of Angelo, Theatre Royal Drury Lane, 1923.